Collect specific confirmatory outcome data. In this first of a four-part series, I outline the logical reasoning behind medical decision making, including Prolotherapy. Part II will explain how to apply such reasoning along with its logical extension, the scientific method, to the daily practice of any Orthopedic (Musculoskeletal) Medicine clinic by establishing expectations for patient care outcome and setting up a database to facilitate outcome assessment. Part III will present an actual case series report based on a scientificallydesigned, evidence-based Prolotherapy practice. Part IV will address the practice of evidence-based Prolotherapy in a peer reviewed, government regulated environment. Reassessing the efficacy and risks of those diagnoses and treatments by analyzing patient outcome. Development of the Scientific Method as a logical, systematic approach to rational decision-making has depended on several cultural innovations, including language, philosophy of science, astronomy, mathematics, and healthcare technology—all springing from the growth of an inquiring human mind. The earliest efforts at Empirical Reasoning have led to the principles of Deductive, Inductive, and Abductive Reasoning—all essential components of logical medical decision-making leading to evidence-based Prolotherapy. Approximately 200,000 years ago, the earliest Homo sapiens (“wise, or rational, man”)1 was evolving in a world of wondrous, inexplicable—and very lethal—cause-andeffect. It was a time when our ancestors were closest to nature—they were a part of nature—and it could be absolutely overpowering. Then, mankind began a very slow journey—developing culturally, adapting physically, creating technology, and learning how to control that hostile environment. In the midst of that primeval, 24/7, reality survival course, early humans could probably not help but observe and recognize obviously apparent correlations of coincident phenomena that they easily construed—or misconstrued—as “incontrovertible” evidence of directly related cause and effect. To the early hominid mind, it was likely a key matter of survival to make correct experiential correlations using all five senses—or perish. You had to be a quick study. Thus, the earliest form of Empirical Reasoning was born in the primitive human mind. The only body of evidence of the evolution of any such early thought process is mute anthropological remains. Who knows to whom the founding of the earliest tenets of Empiricism can be attributed—perhaps his name was “Hunter.” We are left to pure conjecture regarding those opening pages of our decision-making history. Relatively early on, however, it is probable that certain H. sapiens were more successful than others at accurately recognizing healing, even lifesaving, correlations between natural phenomena. Such talent may have been considered as very mysterious, happening through some inexplicable, intuitive “sixth sense.” These more successful hominids founded the societal lineage of the shaman, the medicine man, the healer—all mostly bent on beneficial service. Others may have become politicians or priests. The power of empirical decision-making continued to prevail under the guise of shamanism, superstition, mythology—or theocracy—through thousands of tumultuous unrecorded and, then, recorded centuries. Example 1: The sun is consistently observed to rise daily from the eastern direction, move across the heavens, and set in the western direction—and the sun appears to be the only fiery object that is moving in the daytime sky (Coincidental Precondition A). Ergo, it might be concluded that the sun is revolving around the Earth (Coincidental Consequence B). Example 3 (First Hypothetical): A 45-year-old female villager, mother of five offspring presents the same Rhade shaman with a history of chronic left lower back pain that has become slowly but increasingly uncomfortable with pain increasingly radiating down the left leg to her foot, causing significant physical disability in a world where manual labor is mandatory for survival. There has been no antecedent traumatic event. The shaman recognizes this malady from his mentor’s teachings and many similar personal encounters. He performs a limited examination, perfunctorily palpating the painful area. First, he ascertains that this woman is aging (Coincidental Precondition A), worn by time and a hard life. In his primitive culture, which does not even know the use of a wheel, it seems inevitable that a sore back (Coincidental Consequence B) will eventually happen in most older women and men. He considers aging as the cause of low back pain. He suggests that the woman use a crutch to support the painful side and sit often in the nearby cool stream to relieve the pain because those pragmatic interventions seem to have always helped, at least somewhat, in their past. She is to pray daily to the jungle ocelot to re-attain agile movement. Thus, a clinician can make a diagnosis by empirical rationalization based on a mentor’s instruction or the clinician’s personally observing multiple occurrences of various, seemingly obvious, coincidental or sequential precedents (i.e., so-called “Preconditions”)—such as aging—appearing coincidentally or sequentially with a given injury or disease process (i.e., so-called “Consequences”)—such as low back pain—without further testing the validity of his belief. Through the ensuing prehistoric years, certain thoughtful men most likely began to realize that Empirical Reasoning needed to be supplanted by a more rational approach to decision-making. This could be extremely dangerous, however, and not without risk of a questioning individual’s being held in contempt by the established empirical traditionalists. Such heresy could exact a deadly toll of hemlock-laced Kool-Aid or even a more ignoble and painful demise. Deduction (from the Latin word de + ducere or deducere, “to lead down or away”)11 allows one to derive a specific Consequence B as being caused by a known general Precondition A. 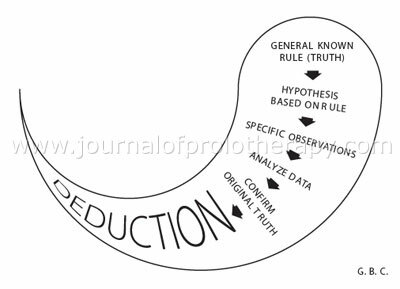 Deduction is a logical process that proceeds from a known general understanding (General Precondition A) to a derived specific conclusion (Specific Consequence B). Deduction is a logical process that requires a validated general premise as the Precondition. The initial general Precondition needs to have been deemed true by measurable definition—independent of sensory, empirical bias.9 Such a General Precondition is often classically expressed in arithmetic or geometric terms, such as the measurement of area, angle, arc—or the range of physiological joint motion. Example 1: It has been ascertained to be true by measurement that the sum of the angles of all triangles is always 180 degrees (General Precondition A). Ergo, if the sizes of two angles of one triangle are known, the size of the specific third (unknown) angle can be deduced as 180 degrees minus the sum of the two known angles (Specific Consequence B). Or… it is recognized by repeated measurement that the normal range (arc) of sacroiliac joint (SIJ) movement on physical testing is within 5 to 10 degrees (General Precondition A). Therefore, if the movement of an SIJ is less than five degrees, especially when compared to the other side, it can be deduced that the joint is abnormally hypomobile or restricted in motion (Specific Consequence B). Example 2 (Second Hypothetical): In about 350 BC, a Greek physician of the Hippocratic School meets a 45-year-old Grecian mother of five, who presents with the same history of chronic left lower back and leg pain as exemplified in the first hypothetical. There has been no antecedent traumatic event. The physician recognizes this malady from his mentor’s lessons and many similar encounters. On examination, he finds the patient’s left leg is physically shortened when she is lying supine. Over the course of his career, he has carefully noted that the vast majority of all such low back pain patients have a shortened leg (General Precondition A) on the same side as the back and radiating leg pain. From that general, measured and recorded observation, he deduces that the back pain problem (Specific Consequence B) is caused by the leg length difference—which he considers anatomical in nature. Therefore, he improvises a sandal heel lift, a technique that has previously helped many of his low back patients. He suggests that the woman use a crutch to support the shortened, painful side—also confirmed by trial experience—and that she sit often in the nearby cool stream to relieve the pain—which he had also often confirmed. She is to pray daily to Asclepios, the Greek god of healing, for Olympian intervention and pain relief. A clinician can deduce a presumptive diagnosis based on previously recorded clinical historical facts and measured physical findings, which seemingly indicate a general truth. However, in deductive reasoning, the general premise or Precondition A (e.g., most low back pain is caused by a leg length discrepancy) might be factually invalid while the specific conclusion or Consequence B (e.g., low back pain may be helped by equalizing leg length) might be, essentially, valid. 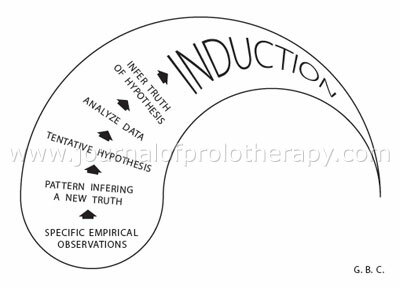 Induction allows one to infer that a specific Precondition A results in a general Consequence B. This logical process is based on making specific observations, perceiving a meaningful pattern in those observations, reaching a tentative hypothesis, and devising a specific test for that general hypothesis to establish a general theory. The established tests (proofs) become useful as stepping stones to establishing further proofs of new hypothetical theory. An inductive statement requires experimentally “proven” experiential evidence for it to be valid. Example 1: It’s observed to be raining outside the building with the rain hitting the street. On multiple occasions, the observer ventures onto the street to test the hypothesis that the street becomes wet during a rain, the observer repeatedly looking at and feeling the street for moisture during a rain (Specific Precondition A). Ergo, without going outside to check anymore, just by seeing the specific evidence of rain from inside the building, the observer can induce, generally, that the street must be becoming wet again (General Consequence B). Example 2 (Third Hypothetical): In 160 AD, a Roman physician of the school of Galen meets a 45-yearold mother of five, who presents with the same history of chronic left lower back pain as exemplified in the first hypothetical. The physician recognizes this malady from his mentor’s lessons and many similar encounters. On examination he finds the painful left leg is physically shortened and abduction of that leg is weakened, a trend that he has observed in many patients with or without low back pain. On palpation, he tests and finds that the sacrum (the “sacred” bone) is rotated and dropped inferiorly on the painful side, also a trend that he has found consistently associated with low back pain, shortened legs, and weakened leg abduction. Also, the left SIJ is restricted in movement. As an additional physical test, he manipulates the sacrum back into normal alignment. He re-examines to find there is no longer any leg length or leg abduction discrepancy. From his detailed examination, treating, and re-examination (all specific tests), he induces that the patient’s specific injury is a hypermobile, displaced sacrum (Specific Precondition A) and that the misaligned sacrum is the specific cause of the patient’s general low back pain (General Consequence B) and associated problems. He retests the patient’s musculoskeletal system by asking the patient to rise from the treatment pallet and walk a short distance to exert some weight-bearing on the sacroiliac joint. She returns to the table and, upon re-examination, he finds that she has remained aligned while claiming significant reduction of her low back pain. The physician suggests that the woman wear a tight belt, which he has also found by experimental clinical trial may reduce her sacral hypermobility and need for physical realignment. She is to pray daily to Apollo, the Roman god of healing. Thus, a clinician can reach a confirmed diagnosis based upon testing a hypothetical general diagnosis by submitting the patient to certain reliable, specific physical, laboratory, or radiological examinations for “experimental” proof. In inductive reasoning, the specific testing premise or Precondition (e.g., an unlevel sacral base can cause low back pain) can be true—while the general conclusion or Consequence (e.g., the low back pain patient is suffering from an unlevel sacral base) can be false—because there might be more than one cause for low back pain. Whereas Deductive Reasoning, is more narrowly concerned in testing a general hypothesis—Inductive Reasoning is more open-ended and exploratory, developing broader generalizations and theories from specific measurable observations. Following the Classical Grecian Age, Inductive Reasoning became the bedrock of philosophical logic and mathematical testing for certainty through the next millennium. Abduction (from the Latin word abducere or ab + ducere, “to lead away”) allows one to infer that a Precondition A explains Consequence B—where there can be multiple explanations for Consequence B. As such, Abduction is built on the logical fallacy of “Post hoc, ergo propter hoc”— ”After this, therefore because of this.” As in all modes of decision-making, Abduction begins empirically with an intuitive hunch or “educated guess.” Precondition A is chosen because it is taken to be the most likely hypothesis based on a hunch. 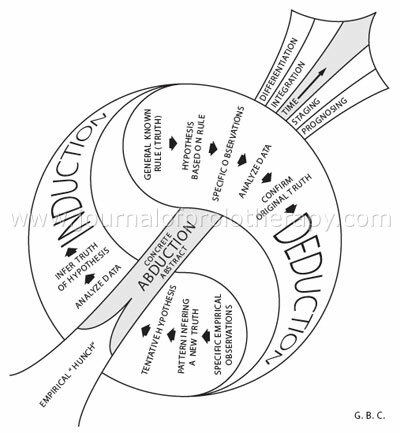 Conclusions by Abduction must be validated by separately assessing each by careful Deduction and/or Induction. Abduction can be helpful as a problemsolver when multiple causes of B are known or expected. Example 1 (Fourth Hypothetical): In 1920, an American osteopathic physician and student of Andrew Taylor Still, MD, DO, founder of osteopathy, meets a 45-year-old mother of five, who presents with the same history of chronic left lower back pain as exemplified in the first hypothetical. The physician recognizes this malady from his mentors’ lessons and many similar encounters. He notes the importance of her history of multiple pregnancies and their prenatal hormonal effect on general ligament laxity. This is verified by her shoe size having increased by a full size since her second child’s birth and her displaying profound Pes planus on physical examination. On questioning, she also remembers having intermittent right interscapular pain. On examination of her gait, she walks with a hesitation limp and pronationexternal rotation of her foot and ankle on the right. As she is walking, she complains of right medial knee pain. Her posture is marked by a significantly dropped right shoulder. Lying supine, her left leg is functionally short by about 8 mm and her left leg abduction is significantly weakened. Her left hamstring muscle is much tighter than the right. Her left ASIS is anterior and the left sacroiliac joint is restricted in mobility. Lying prone, her left inferior sacral her vertebral column is mildly scoliotic with the lumbar convexity to the left and a high thoracic costovertebral hump on the right (perhaps the source of her interscapular pain). The physician determines a complex diagnosis for the patient’s low back pain (Consequence B1), including general ligament laxity and sprain injury (Precondition A1) accompanied by a left sacroiliac joint ligament sprain and misalignment (Precondition A2) resulting in an unlevel sacral base (Precondition A3), a compensatory scoliosis (Precondition A4), and a functionally short left leg (Precondition A5). The Pes planus (Precondition A6) may also be contributory to the low back pain. Compensatory pronation of the foot of the right functionally long leg could be contributory to the right medial knee pain. He also considers a differential diagnosis of the left leg radiating pain (Consequence B2) as being secondary to the sacroiliac/iliolumbar ligament sprain injury (Precondition A2) versus left L5-S1 nerve impingement/ sciatica (Precondition A7) possibly being aggravated by the scoliosis (Precondition A4). His diagnostic summary takes into consideration all the major aspects of what we now know as tensegrity, including the significance of the patient’s dropped right shoulder. His treatment plan includes osteopathic manual therapy (OMT) of the lumbar spine, sacrum, and pelvis. If the patient’s sacroiliac joint does not remain stabilized after the OMT, he will suggest the use of a sacroiliac belt to minimize the frequency of return office visits for repeat OMT for lumbar, sacral, and pelvic realignment. He will recommend intensive physical therapy to lengthen shortened scoliotic and left leg muscle groups (including the painful thoracic costovertebral muscular restrictions) and to regain core postural strength through time. He will recommend orthotics to minimize the further deterioration of the patient’s feet and knees. And he wishes there were a way to permanently stabilize that “sacred” bone. The Nobel laureate novelist, Hermann Hesse, wrote “Magister Ludi.”15 In that novel, he described a game of mental and spiritual gymnastics known as “The Glass Bead Game” (Das Glasperlenspiel) in which academicians could synthesize new knowledge or understanding based on a combination of Deductive, Inductive, and Abductive Reasoning—with a little added Zen. Using an analogous logical process, a musculoskeletal clinician can reach a complex, integrated diagnosis with differential diagnostic options and a matched treatment plan staged through time. In addressing low back pain, he understands by Abduction that there can be more than one cause of a given complaint—and those antecedent events may be coincidental or sequential through the course of time. And a little Zen can always be helpful. Through unrecorded and recorded history, the diagnosis and treatment of musculoskeletal injuries has been of common medical interest. Just as pinworm infestation, ligament and tendon sprain injuries have plagued even the seats of the mighty—especially their low backs. In all the hypothetical examples provided, there has been a glaring need for some way to more permanently stabilize the major offending problem or Precondition of joint hypermobility—in these case examples, the sacroiliac joint. Prolotherapy has emerged as one answer. First, they might have asked, “If the body naturally heals some sprain injuries, why not others?” The nonhealing sprains become persistent or recurring injuries, characterized by chronic pain, hypermobility, and dysfunction—the ankle joint being a good example. Often the injury—especially that of a weight-bearing joint— inevitably becomes worse without definitive treatment. How does the body naturally heal such an injury? Hackett and his colleagues probably had learned in second year medical school pathology that the body’s natural healing process is inflammation. They probably also recognized that ligaments and tendons have a problem naturally healing because they are very dense collagenous tissues with relatively less vasculature through which inflammatory cells might enter a sprain injury site. Then, Hackett, et al., probably experienced, first hand, in the third and fourth medical school years in the clinics and wards, that one of inflammation’s four major characteristics is pain. And, they learned that since we physicians do not like to hear our patients complaining of pain, then we do whatever is necessary to alleviate patients’ pain by prescribing rest, ice (which is anti-inflammatory), compression, and elevation, along with non-steroidal anti-inflammatory medication. The primary autoinflammatory diseases also give the normal healing process a bad name—guilt by association. And then, ubiquitous pharmaceutical advertisements incessantly campaign against any possibility that inflammation does any good at all and that all inflammation must be eliminated by physicians prescribing their anti-inflammatory products. So, Hackett, et al., deduced that if it is a general truth that inflammation is truly the body’s way of healing (General Precondition A), than, re-initiating an inflammatory process at the specific site of a ligament or tendon sprain injury might heal that specific chronic, nonhealed injury and cause the accompanying symptoms and signs to diminish or disappear (Specific Consequence B). They asked, “How does one provoke an inflammatory reaction?” Well, how about re-creating the old injury? “How does one cause a mild injury that is just serious enough to create an inflammatory response?” How about producing the mildest of osmotic tissue stress by injecting a small amount of relatively low concentration (but still hyperosmolar) glucose solution? The rest, as they say, is history. Thus, Prolotherapy was born from early empirical questioning leading to scientific reasoning followed by early clinical trial and learning. Finally, orthopedic medicine had a method of nonsurgically stabilizing that “sacred” sacrum, as well as all the other joints of the body. Over the ensuing years, a body of evidence showing the efficacy of Prolotherapy has slowly begun to take shape. The ultimate goal is to present Prolotherapy as an evidencebased medical approach to treating sprain injuries. Of major importance, there is always need for a textual explanation of theory and technique. Hackett published the first edition of Ligament and Tendon Relaxation Treated by Prolotherapy in 1956.16Decades later, that text still provides invaluable reading for any Prolotherapist. Amongst many early revelations and didactic “pearls,” Hackett led the way in illustrating the referral patterns of ligament pain. Dorman and Ravin’s Diagnosis and Injection Techniques in Orthopedic Medicine (1991) brought radiologic imaging analysis to the forefront.17 Principles of Prolotherapy by Ravin, Cantieri, and Pasquarello (2008) is most recent, very up-todate, complete, and professionally illustrated.18 The Journal of Prolotherapy is another step toward the reporting of peerreviewed studies within the Prolotherapy community. It is all of this basic literature on which evidence-based education and board certification study and testing can be based. Dean Reeves, MD, and other dedicated Prolotherapy investigators have followed through with the next step, which has been to apply inductive reasoning and the scientific method to testing the efficacy of Prolotherapy as a treatment for various forms of chronic musculoskeletal injury and disease. Overall, their induction-based experimental methods have included study of retrospective case series; prospective and consecutive case series; and randomized, double-blind, placebo-controlled cases. These studies have addressed several modes of Prolotherapy for several types of musculoskeletal injuries. In more recent years, equally dedicated and expert investigators, such as David Rabago, MD, have brought Prolotherapy into the arena of Evidence-Based Medicine through the use of systematic review and meta-analysis to identify compelling levels of evidence of the efficacy of Prolotherapy that exists in the current literature. As will be explained in Part IV of this series, more needs to be accomplished at all levels of clinical practice and research in order for Prolotherapy to achieve the levels of confidence required to satisfy peer review and government regulations. In the next of this four-part series, I will explain the basics of a well-designed scientific model for clinical Prolotherapy practice and a database that every clinician can use in daily practice to record and assess outcome. American Heritage Dictionary of the English Language, 4th ed., Philadelphia: Houghton Mifflin Co, 2000. “Empiricism.” Encyclopedia Britannica Online. 09 July 2010: http://www.britannica.com/bps/search?query=empiricism. “Edwin Smith papyrus.” Encyclopedia Britannica Online. 09 Jul. 2010: http://www.britannica.com/EBchecked/topic/179901/Edwin-Smith-papyrus. “Edwin-Smith papyrus.” Wikepedia. 09 July 2010: http://en.wikipedia.org/wiki/Edwin_Smith_papyrus. “Empiricism.” Wikipedia. 09 July 2010: http://en.wikipedia.org/wiki/Empiricism. “Correlation does not imply causation.” Wikipedia. 09 July 2010: http://en.wikipedia.org/wiki/Correlation_does_not_imply_causation. “Causality.” Wikipedia. 09 July 2010: http://en.wikipedia.org/wiki/Causality. Author’s personal observation in Vietnam as US Army Special Forces physician in 1969-1970. “Deductive Reasoning.” Wikipedia. 09 July 2010: http://en.wikipedia.org/wiki/Deductive_Reasoning. “Inductive Reasoning.” Wikipedia. 09 July 2010: http://en.wikipedia.org/wiki/Inductive_Reasoning. “Deduce.” Dictionary.com. 09 July 2010: http://dictionary.reference.com/browse/deduce. “Induce.” Dictionary.com. 09 July 2010: http://dictionary.reference.com/browse/induce. “Abductive Reasoning.” Wikipedia. 09 July 2010: http://en.wikipedia.org/wiki/Abductive_Reasoning. “Charles Sanders Pierce” Wikipedia. 09 July 2010: http://en.wikipedia.org/wiki/Charles_Sanders_Pierce. Hesse H. Magister Ludi (Das Glasperlenspiel) Vintage Classics. ISBN 9780099283621. Hackett GS, Hemwall GA, Montgomery GA. Ligament and Tendon Relaxation Treated by Prolotherapy. 5th ed. Oak Park, IL: Gustaf A. Hemwall, MD;1993. Dorman TA, Ravin TH. Diagnosis and Injection Techniques in Orthopedic Medicine, Baltimore, MD: Lippincott, Williams and Williams; 1991. Ravin T, Cantieri M, Pasquarello G. Principles of Prolotherapy. Denver, CO: American Academy of Musculoskeletal Medicine; 2008. The author is grateful to the peer reviewers and Carol Schneider, PhD, and Allen Parker, EdD, for their expert and wise shepherding of this publication. Special thanks to Dr. Waldo E. Nelson in his textbook,Pediatrics (circa 1965), for his description of pinworm.